I finally finished the box to go with my Beautiful Life journal that I told you about here. At first I couldn't find a box that was the right size for the journal. Then I discovered that those photo inexpensive boxes that they sell practically everywhere fit it perfectly. I bought a plain white one at Hobby Lobby and then painted the outside a creamy color. I embellished the lid with a copy of ephemera Heather provided in her class. The ink in my printer was running low and so it printed out with a pale pink tone - perfect! After that I added some beaded bridal trim to the side of the lid. 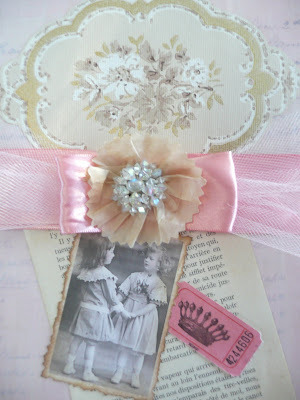 Vintage wallpaper, a page from a French novel, raffle ticket, vintage photo, satin ribbon, tulle, a coffee filter rosette and rhinestone earring finish off the lid. 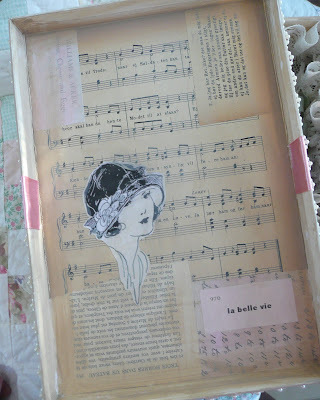 The inside of the lid was collaged with vintage papers coated with glaze. The French flashcard says, "la belle vie" - (the beautiful life). 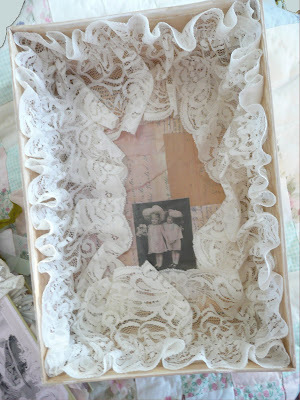 The bottom of the box was collaged just like the inside of the lid and then a wide piece of beautiful lace was attached to the sides of the box and then left to drape down to the bottom, forming the a billowy "nest" for the journal. It's so nice to have such a lovely place to keep my Beautiful Life journal. You journal and box are so beautiful. Love your art. wow -- this is really beautiful! Jeanne, your box is SO gorgeous!!! i love how you embellished the outside, it looks so pretty...love the color too!!! Jeanne, your box looks gorgeous! You would never have known it was just a regular photo storage box! 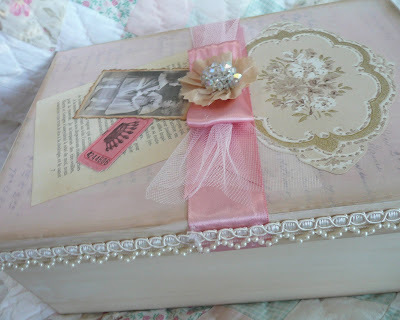 Hi Jeanne, your journal box turned out Beautiful!!! I love the pearl trim and the lace you used on the inside! It looks like your journal is laying on a lacey cloud! Just perfect! This was such a fun class! 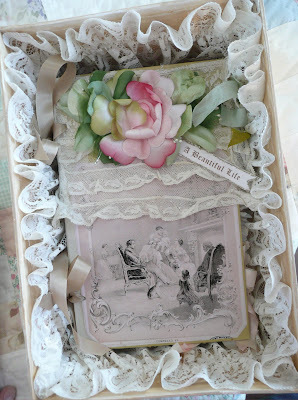 Hi Jeanne.. your box turned out so pretty! Your box is beautiful Jeanne! Thansk for the idea of using the plain photo box...I'll see if one fits my book. Your eye for detail is spot on!!! So inspiring!!! 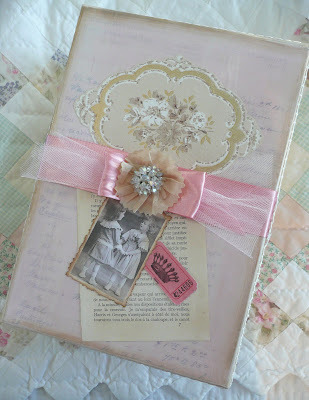 Jeanne your journal is absolutely gorgeous, and what a perfect home you have created for it! Love how it nestles so beautifully in all that lace. I have not made my box yet as I have't been able to find one the right size.